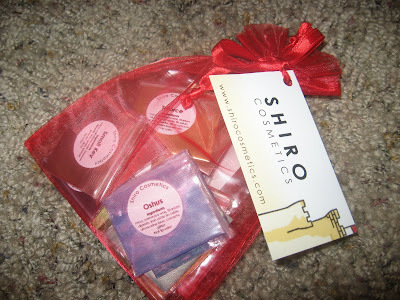 I'm going to reuse this photo from the last LOTD post because you can see the sample sizes (smaller bags, really nice size of makeup inside) and well, because I love them, we get a double take. 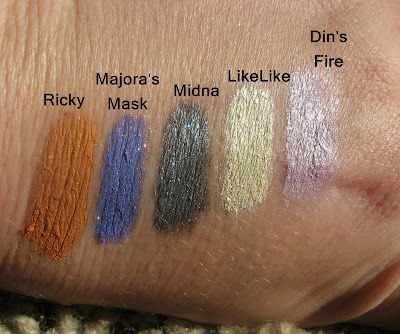 Are you ready for some swatches?! (In my best WWF voice)...here they are! 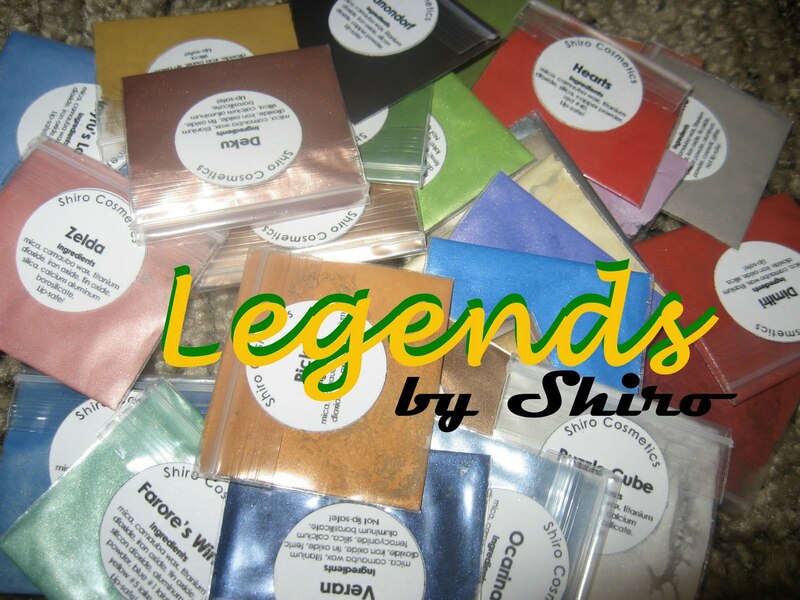 The Legends Collection by Shiro Cosmetics, all based on my favorite game series of all time *drum roll* The Legend of Zelda!! HOORAY! Let's get started! Triforce is a beautiful deep gold. Goron is a yellow brown that is yes, the colour of a Goron. Epona is a pearled deep russet brown with a slight ash to it. 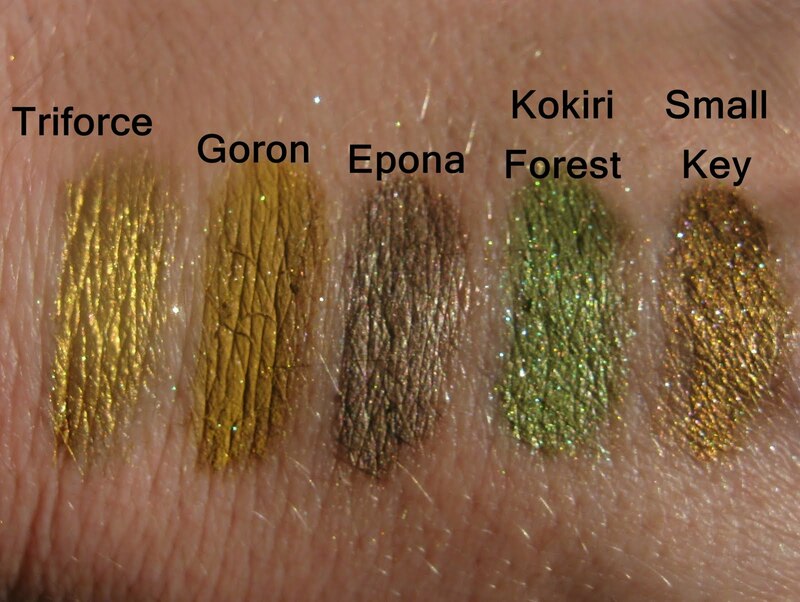 Kokiri Forest is leaf green with a duotone of gold and sparkle. Small Key is a sparkled bronzed brown with a bit of gold sparkle. Farore's Wind is a lovely sea green with ivory sparkle. Moosh is a brilliant bright primary blue with silver sparkle. 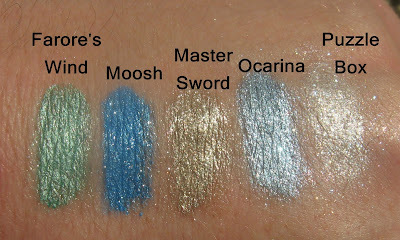 Master Sword is a gilded beige with lots of silver sparkle. Ocarina is a soft grey baby blue with rainbow sparkle. Puzzle Box is a brilliant white with rainbow fire- love it! Here's a closer look! Ricky is a muted deep brown hued orange with some shimmer. Majora's Mask is a bright purple hued blue with blue and silver fire. Midna is this steely grey green with rainbow sparkle. LikeLike is a pale chiffon yellowed cream with lots of pretty sparkle. Din's Fire is a frosted pale mauve pink with pink and white and lavender sparkle. I love the word sparkle. Oshus is this heavenly Caribbean blue with this incredible green gold fire that brightens as you 'rub' the pigmentation in. LOVE! Zora was a bit of a duochrome between muted aqua and blue green with a touch of gold glimmer. Octorok (I hate those rock spitting things) was a fiery red orange with a pretty matte base. Subrosia is a brick red with an almost orange hue to it. Dimitri is a lovely deep autumn like red with lots of red and gold sparkle. Nayru's Love is a soft powdery blue with white and gold sparkle. Boomerang is a golden brown with a bit of metallic gold to it. Zelda (LOVE this one!) is a gorgeous salmon peach with gold and pink fire. The best Peach I've seen...ever! Rupee is lemon yellow green with gold and green spark. 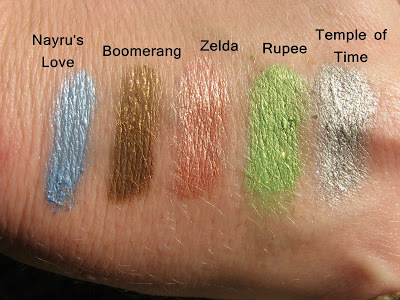 Temple of Time is a frosted platinum with sparks of gold and white. Ganandorf (pig, bulldog, man- what IS he?) is a beautiful deep rich chocolate with a hint of coppery metal and a bit of bronzed red. Lovely colour, for real. Hearts is a nice fiery yellowed red with a little red sparkle. Deku is a bright sparkling mid tone brown with lots of gold fire. Link is a deeper Kentucky Bluegrass green with a bit of green shimmer. Veran is a rich ocean blue with a bit of lighter blue pearl and violet fire. Out of all of these, my top 5 were (in order of love): Zelda, Oshus, Deku, Puzzle Box, and Majora's Mask. 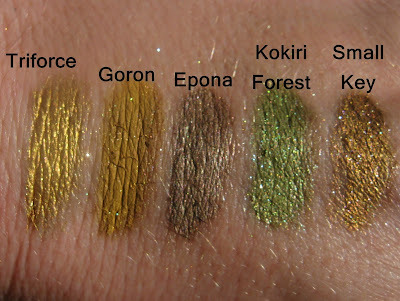 All of these are worthwhile shades- the yellow browns of Goron and Ricky were unique and really beautiful with blue eyes. I am so proud of these colours for some reason. Is it the Zelda factor? Is it that I am really liking Shiro? Could be both. All I know is that I'm really grateful to have them and I hope you get the chance to enjoy them too. I have a great comparison chart coming up and I spent a good chunk of my day browsing Etsy for LOZ items. Triforce earrings?! Yessirree! Great....more to want. Oy! I am LOVING Zelda. That looks absolutely gorgeous and super fun! I just got my samples today so I'm super excited to go home and play with them - yay! Still love the colors, can't wait to see how you end up using them. 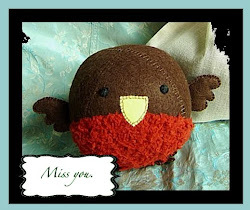 Miss you much. I like the 10 colors that I picked. Zelda looks pretty. I'm probably the one n00b in the entire universe who hasn't played Zelda, but OMG Triforce and Boomerang are gorgeous. OOOOOOH I am so overdue an order ! 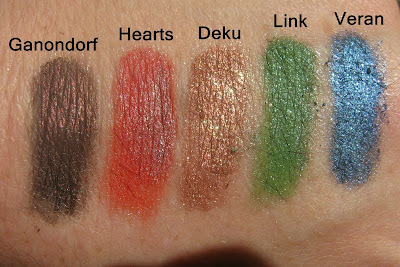 Looking at the photos I wasn't too sure about these, but now I have seen your swatches (one of the first posts I have seen about them because I have zillions of blog posts to catch up on after the holidays) I am SO going to place an order ! Hi Lady! I'd love to see your colour combos with this set. I'm loving them too and Zelda is divine. Reminds me of Titania from Fyrinnae. 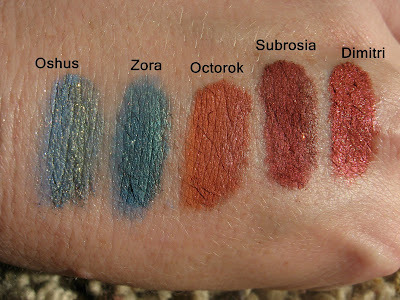 Hi Persephone- Puzzle Box and Oshus are gorgeous shades and I seriously want them in full size! Speaking of gorgeous- I did a look with the My Parents are Hippies and I had quite a few compliments. I love Magick Brownies! Will swatch and review today!! Hi Leira- which ones did you pick? I'd like to know your favorites. Hi Silhouette! You're okay, I haven't played Final Fantasy ever...so I know the feeling. If you can, pick up a used Game Cube at like Play n Trade for around $30 or on Ebay and grab Twilight Princess and the Zelda collector's series (has all Nes/SNes/64 titles) and rescue the princess! :) I loved Boomerang...it's the perfect neutral brown. I loved Ricky too...although yellow browns don't sit as comfortably visually with me- this one was really complimentary to work with.